The easiest and most economic way to have a Real Estate IDX Website without all of the hassles. Level Up Your IDX Website for a Fraction of the startup cost. 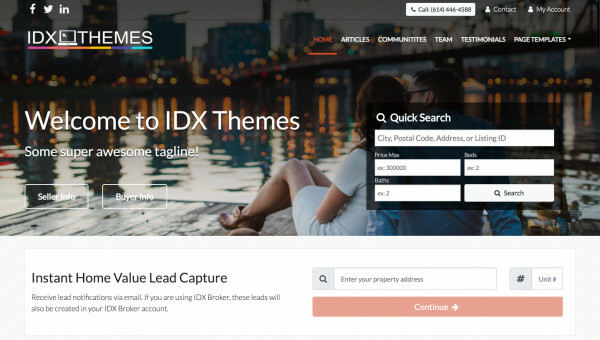 3 community pages of your choosing with 3 IDX Property Quick Property Results Links per community, Featured Properties, and Local School Ratings data. Premium Website Hosting with Solid State Drives and a FREE SSL (https secured website vs http insecure). This is a savings of around $50 - $70 / year alone compared to other hosting solutions who charge for an annual SSL. Google Analytics and Webmaster Tools integration. SEO Friendly sub-domain setup (if using IDX Broker). We offer premium hosting at a fraction of the price of other solutions. All of our hosting servers run on Solid State Hard Drives with dedicated RAM resources and include a FREE SSL. No more worrying about Google penalizing your site for not being secure. Let us handle the technical nonsense and you can get back to creating content and selling real estate. A: Yes of course. If at any time you want to leave, we just charge a 1 time $100 fee to help you move your site to another hosting solution. It is always yours and you are free to go at any time. Though, we do not think you will.